Dimensions 135° angle 1 in. x 1/16 in. Available in a satin anodized finish in 12 ft., 8 ft., 6 ft. and 4 ft. lengths. See above document link to display all angles in a Table View. 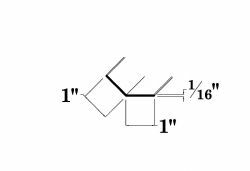 1" x 1" x 1/16" Satin Anodized Equal Leg 135° Angle. Stocked in 12 ft., 8 ft., 6 ft. and 4 ft. lengths.